How did the Seneca Academy kindergarten begin? Our kindergarten began over 20 years ago as a half-day program of The Circle School, as our preschool was formerly known. Parents sent their children who were ready for an all-day kindergarten experience attended public school for morning class and our program in the afternoon. Soon afterward, the school began to offer an all-day program for children who were ready for a more challenging educational experience than public school, and more affordable than other private programs. How is Seneca Academy kindergarten different from public schools? Our school has always offered a balanced educational program that both challenges and nurtures each child. 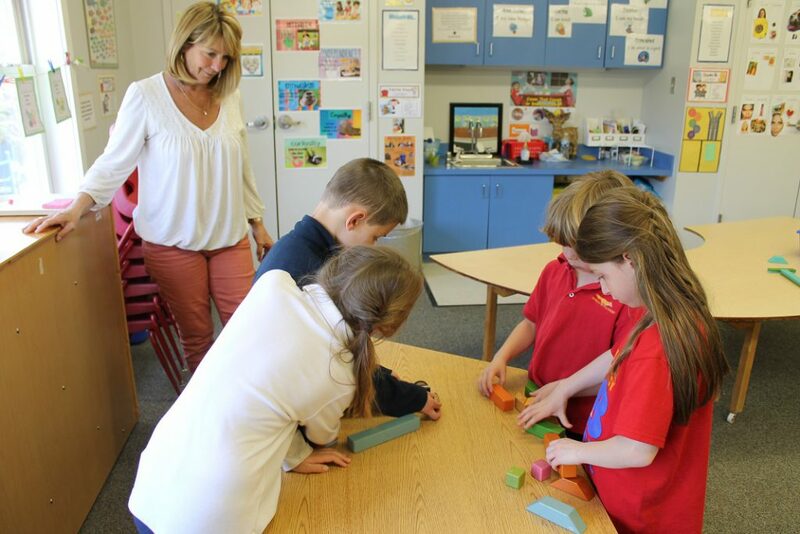 We have small classes with experienced teachers who carefully choose activities that are developmentally appropriate and educationally engaging. Each child is carefully observed and fully understood by teachers. Do you give homework in the Seneca Academy kindergarten? There is very little literature that suggests that giving homework in kindergarten is related to increased learning or achievement. Therefore, we do not give homework on a regular basis to Seneca Academy kindergartners. We do ask that all of our children engage daily in some sort of reading, whether with an adult or individual reading. We cover a great deal of academic work during the school day and we believe children at this age need time after school to focus on other activities. How small are the classes and why is that important? Seneca Academy kindergarten classes have no more than 16 children with a teacher and an assistant. We feel that with small classes, each child’s needs can be ascertained and met. The most recent research suggests that small classes positively relate to increased learning and academic engagement. What if my child is already reading (or is advanced in math)? Kindergartners are often very uneven in development and thrive with a teacher who can pay attention to each individual. Children this age may have spurted ahead academically but need help in working through the social and emotional components of their development. Alternatively, they may be very adept at making friends and following directions, but may still be working on solidifying early academic skills. They may even have trouble separating from a parent but be able to read books. This is a picture of a typical kindergartner! Our teachers identify each student’s strengths and areas needing development and create lessons which challenge all students. Small class sizes allow this to happen throughout the day. What do students do during the day? In the morning students begin with a Morning Meeting and their first academic period. Later they have snack, gross motor play (usually outside), and resume their academic studies. Academic subjects include integrated mathematics, language arts, science, and social studies. After lunch, students have 20-30 minutes of “brain rest” and another period of outside play, or physical education; afternoons include discovery, music, art, or Spanish. In “discovery,” children choose from activities which may include follow-up activities from the morning, puzzles, block building, board games, and pair share reading. The most popular activity is the Writing Center where children begin to write and publish books, to their great delight. The day ends with their teacher for closing activities. Do the children have classes with any other teachers? Students spend time each week with our physical education, Spanish, art, and music specialists. How old does a child have to be for acceptance in Seneca Academy kindergarten? We have found that students are most successful in the program when they are older and have the stamina to stay on task for the entire day. Research shows that girls should be fully five and boys five and a half before they enter class. Typically at least half of the students turn six by the end of the calendar year. Every student must be five before September 1 of the year they begin at Seneca Academy. Are children prepared for first grade after kindergarten? We are often told that our students are extremely well prepared for a challenging first grade program, whether at Seneca Academy or another school. They have been instilled with a love of learning which produces self-assured, independent, engaged students who are ready to proceed down the road of higher education.